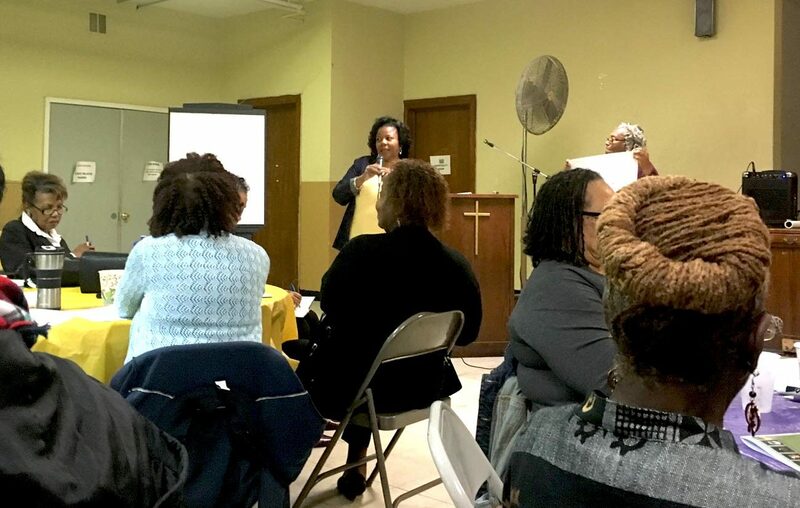 Parishioners from across the Archdiocese of Philadelphia meet Oct. 15 15 at St. Cyprian Church in West Philadelphia to discuss preparations for National Black Catholic Congress XII next July in Orlando, Fla. Dozens of the faithful came together Saturday, Oct. 15 at St. Cyprian Church Southwest Philadelphia to pray, participate in group workshops and make presentations in preparation for next year’s National Black Catholic Congress XII to be held in Orlando July 6 to 9, 2017. It is little wonder that preparation for the congress is taking place so early. Parishioners from the Philadelphia Archdiocese last traveled to Indianapolis in 2012 for the national event that has been held in a different city every five years since 1987. Among those present at the Oct. 15 event were Deacon Bill Bradley of the archdiocesan Office for Black Catholics, Norbertine Father Gerard Jordan and Msgr. Federico A. Britto, the pastor of St. Cyprian Parish. Also on hand were representatives from St. Athanasius Parish in West Oak Lane, St. Raymond of Penafort Parish in Mount Airy, St. Cyprian, St. Barbara and St. Rose of Lima parishes in Southwest Philadelphia, Our Lady of Hope and St. Malachy parishes in North Philadelphia, St. Ignatius and St. Francis de Sales parishes in West Philadelphia and St. Thomas Aquinas Parish in South Philadelphia. Deacon Bill Bradley put in a good word for the annual St. Martin de Porres Mass to be celebrated on Thursday, Nov. 3 at the Cathedral Basilica of SS. Peter and Paul, with musical prelude at 6:30 p.m. and Mass at 7. Finally, representatives attended from St. Joseph’s University, the Philadelphia Archdiocese, the Spirituality Center at Daylesford Abbey in Paoli and Corpus Christi Parish in Lansdale. Deacon Bradley added that Catholic schools are not there solely because they are seeking to educate Catholic students. “The reason they exist is not because they are Catholic, but because we are Catholic,” he said. The official agenda for the meeting included three group discussion questions. The first asked how social media could be used effectively to promote the cause of sainthood for Mother Mary Lange of Baltimore, Venerable Henriette DeLille of New Orleans, Venerable Pierre Toussaint of Haiti and the Servant of God Father Augustus Tolton. The latter is the first African American priest, whose cause is being championed by Father Jordan. The second question dealt with how the church can honor the achievements and wisdom of people in local parishes. It further focused on the types of intergenerational activities that could be planned. Finally, participants were asked to take into account the fact that many African Americans are in poverty, marginalized, lack health care, are incarcerated, victims of violence, suffer legal injustices, and the like. They addressed how can parish communities rise above these inequities to lead the joyful life that God intended for them. The attendees were also given information about the National Black Catholic Congress XII event. Groups from the Philadelphia area are already booking buses and flights for the summer conference in Orlando. Martin de Porres Scholarships are available for the trip and are being disseminated through local parishes. He put in a good word for the annual St. Martin de Porres Mass to be celebrated on Thursday, Nov. 3 at the Cathedral Basilica of SS. Peter and Paul, with musical prelude at 6:30 p.m. and Mass at 7. The National Black Catholic Congress was founded as the Colored Catholic Congress by Daniel Rudd in 1889. The five initial national congresses of African American Roman Catholics were held from 1889 to 1894. The congresses were revived in 1987 under its current name. Their mission is to improve and enrich the lives of African American Catholics.